Sarah Pinsker is a writer, singer, songwriter, and a vital part of her local SF/F community. As a writer, her work is a heartfelt blend of the domestic and the terrible, the mundane and the fantastic. Sarah Pinsker has a keen ability to turn over the ordinary details that make up our lives and give them a fantastical spin that exposes a dark, hidden world. 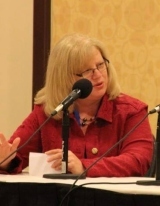 A Nebula and Sturgeon Award winner, her work has appeared in such publications as Asimov’s, Strange Horizons, Fantasy & Science Fiction, Lightspeed, Daily Science Fiction, the Journal of Unlikely Cartography, and Fireside as well as numerous anthologies. In “Under One Roof,” Sarah Pinsker weaves fantasy with a sprinkling of something more sinister that will make you reconsider every bump in the night. Uncanny Magazine: “Under One Roof” is a wonderfully creepy story built around a locked room mystery, filled with ghosts, spirits, and the things that make up a life well–lived. The idea that people, emotions, and even physical items can leave an imprint on a physical space is not new, but always fascinating. Is it a theory you subscribe to? Sarah Pinsker: I think there are definitely places you walk into and feel the presence of the people who came before, for good and for bad. Personally, the inverse of that works as well. I’m a person who gets very attached to places large and small. They imprint on me more than I imprint on them, but I do tend to overlay all my memories of a place that sticks with me. It’s not a stretch from there to explore the idea of a place that collects that same kind of memory, in a more tangible form. Uncanny Magazine: While there is something really terrifying about Josh’s double forever being linked to the house, there is also something creepily appealing about the idea of spending an eternity working, uninterrupted, on a task you love, without responsibility or recrimination. As a very busy creator, did you intentionally build this appeal into the story or is it a happy (but slightly scary) accident? Sarah Pinsker: Ha! To be honest, I didn’t even see that layer until you mentioned it. Um, I mean, “Of course I meant to do that!” That must be my subconscious at work on me. I was more interested in the questions of change and stasis as they applied to the relationship. The initial story was the superficial one—the shock of seeing the double without any of the ramifications. As I came back to the story again and again, I started teasing out the deeper ideas, but that particular aspect was an accident. Thanks for pointing that out. I could get so much done with a double in the attic. Uncanny Magazine: The scene where Court throws the ghost boy out of the window is extremely tense and incredibly fraught with meaning. The push and pull of wants versus needs in this story is delicious and fits in well with the domestic narrative. You’re a writer who has a deft hand at mixing those domestic details into their work, giving it a richness of emotion and place. Is it something you deliberately strive for or is it built into the DNA of your writing? Sarah Pinsker: Built into the DNA of my writing, I guess. It’s funny; I give a lot of detail in some areas, but not in others. I almost never describe what my characters look like, unless that’s somehow significant to a story. I like the other kind of detail. Detail is how you build lives that feel real and lived in. Shared experiences, items of significance, private jokes, how people position themselves in a room with each other. When I figure out what I’m going for emotionally, I go back and make sure the details support it. Uncanny Magazine: Josh’s curiosity about the locked attic is the driving force of this story. While there are many ways to interpret his intense desire to unlock the door—both from an internal and external perspective—the fact is, some people are compelled to discovery. Are you the type of person to walk past a metaphorical locked door or do you have a driving sense of curiosity that makes you want to discover and learn more? Sarah Pinsker: I’m a little of both. I can resist pushing a button if I don’t know what it does, but I can’t help imagining what would happen if I did. As a kid, I often stayed behind when my friends climbed over fences, but I think my imagined version of what they found was always better than the reality. If I don’t look behind the bricked up fireplace, there could still be a secret room there; if I look, I find out there isn’t one. I like exploring within the rules, but luckily my imagination isn’t as restrictive. Uncanny Magazine: This story is set in Baltimore, where you currently reside, and you live in an older neighborhood. While it is tempting to push personal details onto a writer’s work, those facts beg the question as to what was the inspiration for this story. Sarah Pinsker: I don’t always use personal details in my work, but this story had a very direct real–life inspiration. We live in an almost one–hundred–year–old house. We rented it semi–furnished when we first moved in. The owner was a guy who had bought the house, met someone, and moved overseas to be with her, leaving all his worldly goods behind. Most of his stuff was scattered throughout the house, or in boxes in the basement. It gave the house a sort of Room of Requirement quality: if one of us walked into the kitchen and said, “I sure wish we had a waffle iron (tortilla press, mandoline, etc)” and looked in a certain cabinet, we would find one. There was one large locked room in the attic where he’d put the things he actually cared about. The door had a pin–sized hole at about eye–level, and if you looked through it, all you could see was a tunnel of boxes and a framed picture at the opposite end of the room of a demon sitting on a toilet. Very classy. We made up all kinds of ideas of what he’d locked in there. Eventually he realized he was staying in Europe and he sold us the house. We made one of the stipulations of the contract that we had to be let into that room before we bought it, in case there was a gaping hole in the roof or water damage or something. Nobody on this continent had a key, so the rental company paid for a locksmith to come let us in. It wasn’t nearly as exciting as in the story. There were some cool old toys, actually, and old coins. Then the ugly demon picture, lots of office supplies, stacks of sealed boxes, and then a whole bunch of highly combustible stuff that probably shouldn’t have been in a locked unventilated attic room: paint, lighter fluid, charcoal for the grill, cleaning products. He moved it all out when we settled, but I kept the idea of the locked room full of awesome stuff in my story file for ages before finding a good story to go with the premise. For the story I chose my previous neighborhood in west Baltimore (where I’d lived in an even older house) but kept the central idea of the locked room. Uncanny Magazine: If your house had an attic such as the one in this story, what artifacts from your life do you think would reside there? Sarah Pinsker: I don’t even want to think about that! I have a terrible habit of keeping everything. I ascribe meaning to artifacts that are better left behind. It’s something I’m working on. The absentee landlord in this story isn’t living in the house with all his stuff—not that all of it is his. The idea that after a while I couldn’t get rid of things even if I wanted to is a horrifying one to me, maybe because it’s the punishment I deserve for keeping things I shouldn’t have kept in the first place. That’s one of the layers underpinning the story too, I guess. 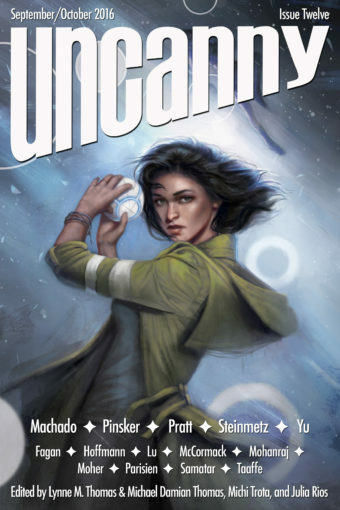 Uncanny Magazine: Thank you, Sarah, for giving us a fascinating look at your creative process!